In Modi’s leadership from 2014 to till date, Indian markets have made some history. Investors appetite for equities increased continuously with IPO market witnessing boom, midcap and smallcap indices soaring to new level. The NDA government is celebrating four years of rule in India, as their leader Narendra Modi was sworn as Prime Minister of the country on May 26, 2014. Modi led the BJP's campaign in the 2014 general election, which led to the party bagging a massive majority in the Lok Sabha. Thereafter, PM Modi in his four year reign has introduced various schemes that affected virtually each aspect of the citizens' life, from toilets, affordable housing to delivery of subsidies in new form. Not to forget, he also launched a drive against black money through his demonetisation move and also brought the country under the umbrella of Goods and Services Tax (GST) regime. When Modi’s BJP party won in the month of May 2014, Indian market welcomed the new government with open arms and happiness reflected in the performance of Sensex and Nifty 50. On May 02, 2014, the benchmark Sensex was trading at 22,403.89 level, and within 24 days this index surged by 2,312.99 points or 10.32% and reached to 24,716.88 mark on May 26, 2014, when Modi sworn as PM. Same was the case of Nifty 50, this index stayed at 6,689.50 level on May 02, 2014, jumped to nearly 815 points or 12.18% in 24 days and crossed over 7,500-mark. Since May 26, 2014 to till date, Sensex has soared by a massive 11,727.10 points or 47.45% and clocked an all-time high of 36,443.98. 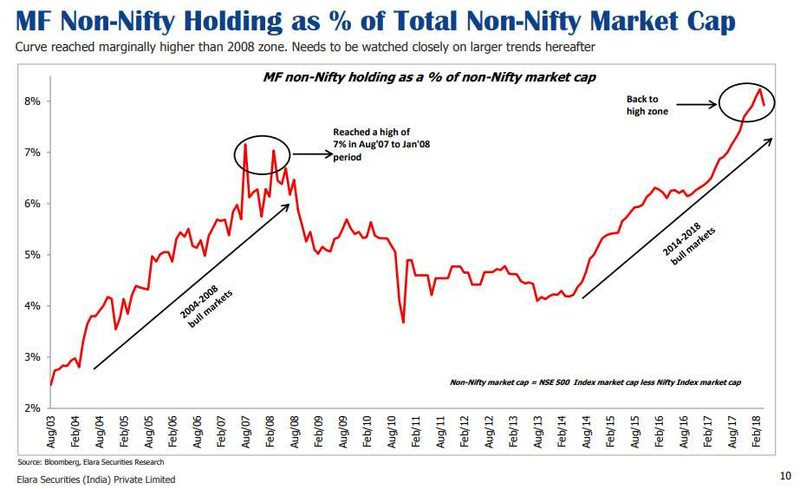 Even Nifty 50 showed a promising growth by surging nearly 3,668 points or 48.87% and witnessing high of 11,171.55-level. By end of April 2018, India’s share in the world market cap is at 2.8% (up 10bp YoY). Over the last 12 months, world market cap has increased by 13.2% (USD9.5t), while India’s market cap is up 16.5%. In April 2018, Nifty bounced back strongly and returned 6.2% which is highest monthly gain in 24 months. The benchmark slipped by 4.9% in February and 3.6% in March. As for Sensex, the index has grown by 7% in April month, which is way higher compared to global markets. Globally, UK (+6%), Japan (+5%), Korea (+3%), Russia (+2%) and Brazil (+1%) were the key global markets to close in the green in local currency terms. On the other hand, Indonesia (-3%), China (-3%) and Taiwan (-2%) were among the worst performers. According to Elara, One key trend here is the midcaps relative pattern. 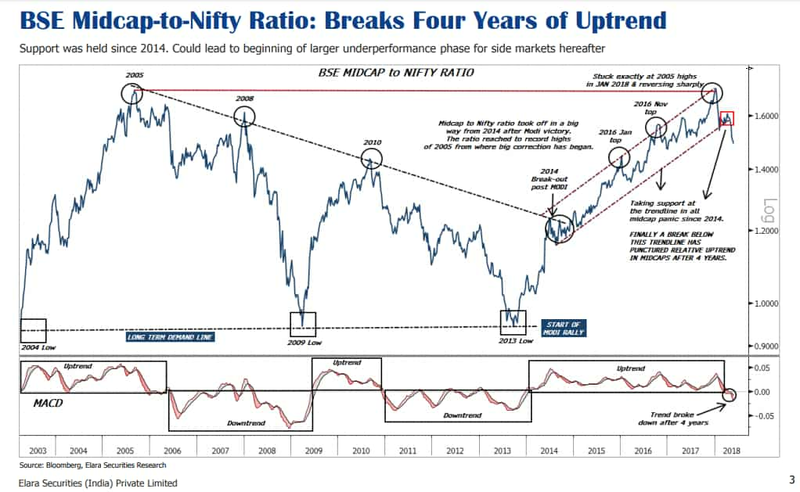 Post 2014, midcap-to-Nifty ratio broke out of a decade cycle downtrend on the back of midcap chasing. The ratio has been following this uptrend for the past four years. “We saw two large setbacks in midcaps over 2016-17, but this trendline has held well. In this leg, we have seen a big reversal in the trend emerging after four years. In this round of market correction, relative performance of side market has already reached a two-year low, ” Jain added. Since 2014, midcaps have seen three large round of corrections during January 2016, November 2016 and May 2017). 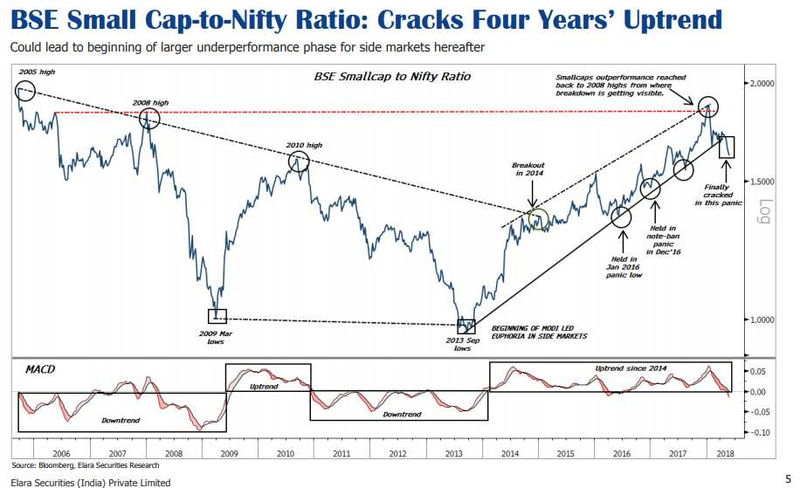 In all three rounds, the retracement in Midcap-to-Nifty ratio from the highs in the range of 6-8%. However, in this round, midcaps have already retraced 14% from top, puncturing the Bull cycle. In terms of sector-wise performance, Elara highlighted, we had seen such breakdowns in the Metals-to-Nifty ratio in 2014, Pharma-to-Nifty ratio in 2016 and breakouts in Auto-to-Nifty ratio in 2014 & now IT-to-Nifty ratio in 2018. All of these have transformed into medium-term trends. Notably, in what is going to hold India in good stead globally, under his leadership, the country jumped to 100th rank in the 2018 Ease of Doing Business ranking by World Bank. Considering the above factor, one can definitely applaud Modi’s reign in Indian markets as they have definitely become a money making indexes for investors.